Natsume Yuujinchou continues to be a slightly-under-the-radar success story in Japan. I see toy Nyanko-senseis all over the place, but I have to say even there, I’m not sure if they know the character or just bought what they thought was a cute generic cat. Certainly there are a lot of fans watching this anime, going to the themed cafes and buying the figurines, but it simply doesn’t feel like a big anime, in the way that Yuri on Ice or Attack on Titan do. Yet it’s continued into a sixth season now, sadly only 11 episodes but going strong. No cute fox-boy episode this time, but a lot of new development for Natsume himself, then interesting twists at the end where Natsume finally shares the secret of his book of friends with another human, plus starts to think about his grandfather. The show remains episodic, of course, as it always has been. Natsume and his supernatural friends help out more interesting youkai, from a funny old fellow who leaves flower patterns on rocks and has lost his apprentice to an interesting crow-boy who fell in love with a human but left her without closure – only for her to trick him in a fun reversal of the usual folklore stories. The art has settled now – it doesn’t have its own clear style, but it always looks pleasant. Something that wasn’t guaranteed in the first couple of seasons. 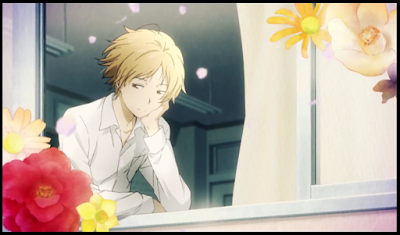 Natsume is pretty and likeable and oddly touchy-feely with his friends and mentors in this season – perhaps aimed at the female fanbase. There was very little real development except in the final double-episodes here, but Natsume is getting inexorably drawn into the world of the exorcists – and I want to know what happens when he can no longer escape their pull. It's a favourite of mine just now. After 6 seasons, I still want more!